Sayori (Hyporhamphus sajori) | Better Know a Fish! Recently, my friends and I went to try out a Japanese restaurant new to us, but reputed to have some quality sashimi. A quick glance at the “Today’s Specials” whiteboard found a fish new to my tastebuds: sayori, or the halfbeak. A new fish to try out? I’ll have one order, please. Halfbeaks are marine fish belonging to the Order Beloniformes — belone translating as “needle” in Greek, describing the slender form of many of these fishes. Beloniform fishes also include flying fish, needlefish, as well as sauries, one of which we visited in a past blogpost. Family Hemiramphidae contains the halfbeaks — named because their lower jaw juts out farther than their upper jaw. The halfbeak is actually a very long extension of the part of the mandible that is below, and in front of the teeth — a chin. The structure is smooth and not armed with teeth. This is our first clue that the structure is not an elaborate jaw used in prey capture. If it’s not part of the feeding apparatus, then how does it function? McGee further explains proposed theories on the function of this well-endowed chin, including one hypothesis that it serves as a special sensing probe to detect prey in darkness. You can read more in his blogpost. And how did the sayori taste to my sensory cells? Clean and delightful. The flesh was densely packed and firm, as you would expect from a thin, muscled fish. The shiso leaf tucked in the nigiri provided a minty counterbalance, and the spiced, berry-sweet sauce on top added another twang. 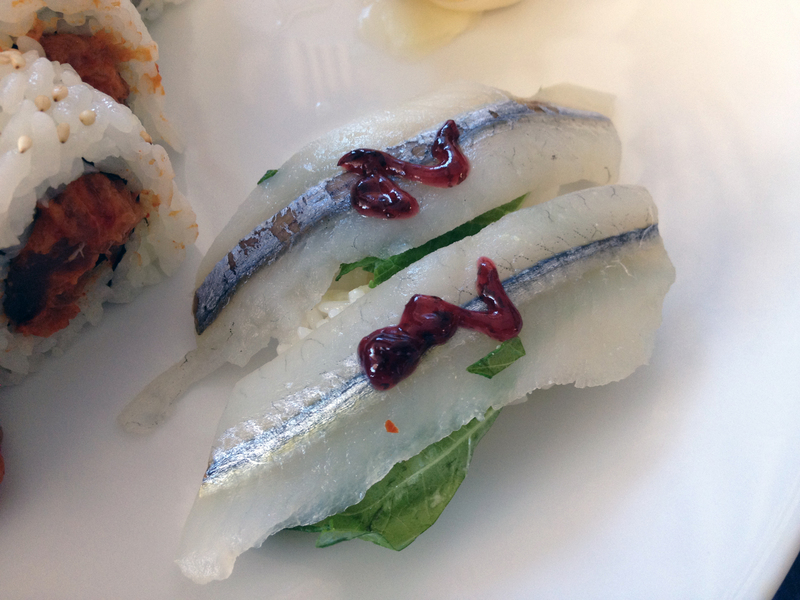 I did not get a chance to ask the chef the geographic origin of my halfbeak, but for the sake of a discussion on Japanese cuisine we will assume it is the Japanese halfbeak (Hyporhamphus sajori), a species native to Japan’s waters. Anglers from the southeastern United States will find it reminiscent of another halfbeak species — the ballyhoo (Hemiramphus brasiliensis), popularly used as trolled baits to catch sailfish and other open water gamefish. This entry was posted in Actinopterygii, Beloniformes, Estuarine Fish, Marine Fish and tagged Asia, baitfish, Beloniformes, foodfish, halfbeaks, Hemiramphidae, Hyporhamphus sajori, Hyporhampus, Japanese halfbeak, Pacific Ocean, sashimi, sayori. Bookmark the permalink.